Iceland sits above the Iceland plume, a hotspot believed to be the cause of the island’s volcanic activity and geothermal phenomena. 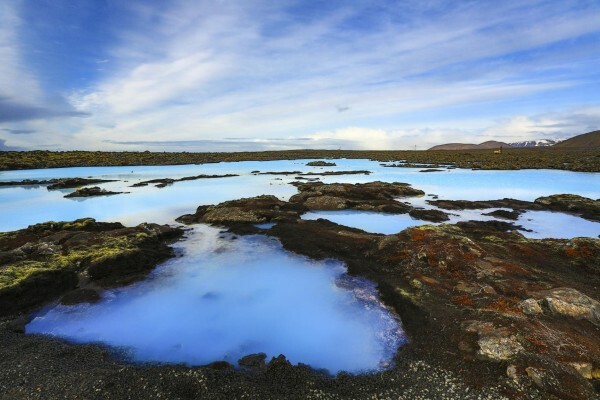 From spraying geysers and exploding volcanoes to naturally heated hot springs and thermal springs, tourist itineraries in Iceland fill up quickly with day trips to see first-hand this small island’s impressive feats of nature. Easily one of the most famous and most visited attractions in the country, Blue Lagoon often tops the to-do lists of first-time visitors. The vivid milky-blue shade of the lagoon’s water is perhaps its defining feature. The enormous man-made geothermal spa is also world-renowned for the healing qualities of its mineral-rich water. With pool temperatures ranging from 37 to 39 C (99 to 102 F), the spa is ideal for a leisurely day, or to soothe skin conditions like psoriasis. After a nice soak in the thermal waters, pamper yourself with one of many spa treatments available, like a sauna, steam bath, or mud masks. Make sure to climb to the top of the viewing platform to admire the panorama below. Only an hour’s drive from Reykjavik, the lagoon is a perfect Iceland trip from the capital. One of the most famous geysers in the country, Strokkur offers the most reliable reward to those who make the trip, with eruptions every four to eight minutes. It puts on an impressive show, shooting water up to 15 to 20 m (49 to 65 ft) in the air, sometimes even reaching heights of 40 m (131 ft). Dormant until 1789, when an earthquake shook the geyser and cleared the opening, today it draws crowds who come to catch the frequent sprays from the geothermal crevice. Strokkur forms part of the Haukadalur geothermal area, where you’ll find nearby mud pools, fumaroles, algal deposits, and other geysers. The first geyser recorded in print, Great Geysir is the origin of the English word geyser, which refers to an erupting hot spring. First described in 1294, the geyser has been active for roughly 10,000 years, although years have passed with no eruptions at all. When the hot spring does spout, the boiling hot water can reach as high as 70 m (230 ft). 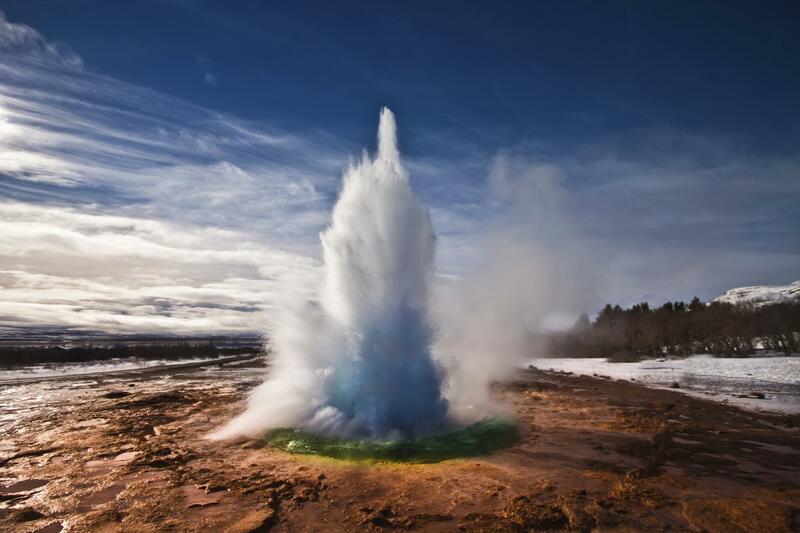 Combine your visit with a view of Strokkur geyser just 50 m (164 ft) south in the Haukadalur valley. The geyser’s activity is linked to earthquakes in the area. If you can brave the intense smell of sulfur, the active geothermal area at Gunnuhver Hot Springs won’t disappoint. The area is home to volcanic terrain, steam vents, and boiling mud pools, including the largest in the country. At 20 m (65 ft) in diameter, the pool boils up around the rims, so keep your sightseeing at a distance. Gunnuhver takes its name from the legend of an angry witch called Gunna, whose spirit became trapped in the springs 400 years ago by a local pastor. With the warm mist rising from the cracks in the volcanic rock, and vexed Gunna in the back of your mind, the landscape has an eerie feel to it. 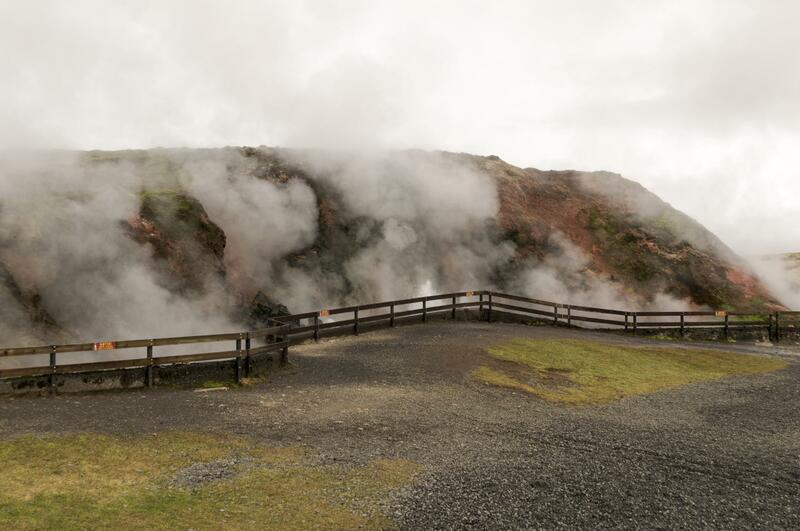 Nautholsvik Geothermal Beach stands out among Iceland’s other geothermal attractions thanks to the mix of hot geothermal water and cold Atlantic currents, which gives the beach a very different feel. Here, partake in the Icelandic tradition of cold-water swimming, and then hop straight into a hot pot, or steam bath, to warm up. The beach is a great place to see what Iceland is best known for from your relaxing vantage point sunbathing on the sandy shore. These natural attractions are just the tip of the iceberg in Iceland. You can easily use our itinerary planner to fill your time visiting active volcanoes and spouting geysers, but don’t overlook the country’s cultural side as well. Experiment with local Icelandic dishes, discover the country’s traditions, and appreciate the urban capital.